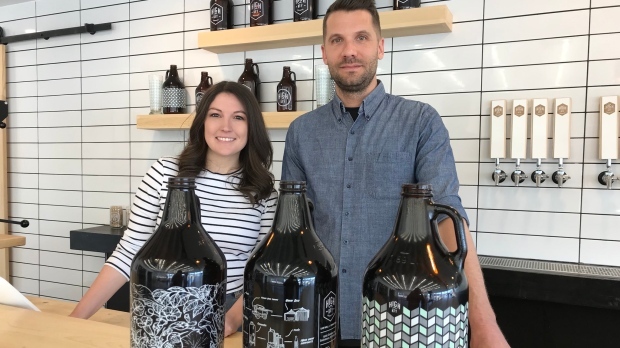 The designs of Craig Wilson, right, are featured on the growlers of High Key Brewing Co., run by Madeline Conn.
A Saskatoon brewery is partnering with local artists to design the wraps for its growlers, with part of the proceeds going to charity. Madeline Conn opened High Key Brewing Co. nearly one year ago after a six month trip to Dallas, Texas. “I just fell in love with the micro-brewery scene down there, just kind of spoke to everything I love,” she said. Good beer and getting involved in the community are some of the reasons Conn opened the brewery. One way High Key Brewing supports local initiatives is by teaming up with local artists, who design a wrap for their growlers. The brewery does two limited edition growler runs a year, each time working with a different local artists who come up with any design of their choice. The most recent wrap was created by graphic designer Craig Wilson. “I was just surprised and excited to be part of it,” Wilson said. Part of the proceeds made from the growler sales goes to a non-profit organization of the artists’ choice. “Not only are they promoting themselves, but they’re also promoting an organization in Saskatoon that has some meaning to them,” Conn said. Wilson is supporting Sanctum Care Group, an organization that provides hospice care for people living with HIV/AIDS. The first growler run was designed by Steph Mah who supported Saskatoon Nature Society. The second run was done by Aiden Searle supporting Canadian Mental Health. Wilson’s design is down to its last five growlers, leaving Conn on the hunt for the next local artist.